I’ve spent the last month working out religiously and trying to eat at least moderately well. And the numbers on the scale are going up, not down. Infuriating. So I’m looking for a kick-start before things get too out of control, and I think I’ve found it: a gluten-free diet. 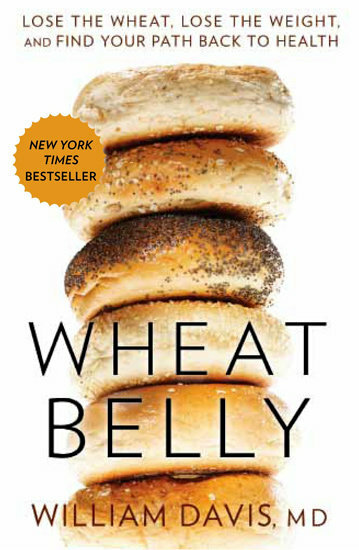 I’ve just finished reading “Wheat Belly,” and if everything Dr. Davis says is true, eliminating gluten can help me lose 14 lbs in two weeks. Too good to be true? Davis‘ main point is that modern day wheat has changed so much that it wreaks havoc on every part of our system. Wheat raises your blood sugar and makes food addictive, so you want more bagels, more pizza, more muffins. The fat we store from wheat sits on our bellies and causes all manner of health problems. Lose the wheat and you can reverse diabetes, high blood pressure, high cholesterol, even aging. I’m really just looking to reverse the direction of the scale right now, but at this point I will try anything. I’m a prime candidate for this because I’m extremely wheat dependent. I can eat three bowls of pasta for dinner – every night of the week- no sweat. So I’m hoping that this program will be such a shock to my system that it will show some serious results. I’m not expecting it will be easy, and I know I’ll never be able to give up my beloved pasta for good, but I’m going to do this right for at least one month. 1. Lots of fresh vegetables (except for potatoes and corn- not allowed), but minimal fruit (tomatoes and berries are ok, but others can raise blood sugar too much). Minimal beans (1/2 cup per serving or less), these also raise blood sugar. Highlighting lots of fresh vegetables and fresh, unprocessed food in general is a major tenant. 3. No pasta, bread, cereal, etc. Nothing made with wheat. This is tricky because wheat pops up in a lot of things you wouldn’t expect. Soy sauce, some salad dressings, ketchup – I just found out my vitamins have wheat, so I can’t even take those anymore. But you can have crackers or products made with flax. 4. No “gluten-free” alternative foods like crackers or bread, not even brown rice pasta – these are often made with substitutes that can spike your blood sugar just as much, if not more, than wheat. 5. No sugary desserts like ice cream – the carbohydrates in things like this will just derail you. I’ll be looking for some sugar-free alternatives, but they’ll need to be made with stevia or truvia – other sweeteners can spike blood sugar. “Sugar free” alternatives are also to be approached with caution- if they have more than 10 grams of carbs per serving, they’re no good. Dark chocolate, in moderation, is allowed – the darker (and thus, less sweetened), the better. Today, I’m starting off by clearing the excess wheat products out of my fridge, and shopping for some alternatives. I’ll report back and let you know just how bad my wheat withdrawal becomes, but in general I’m looking forward to giving this a shot. Check in for recommendations on recipes I’ll test and products I’ll try. Ready…set go!